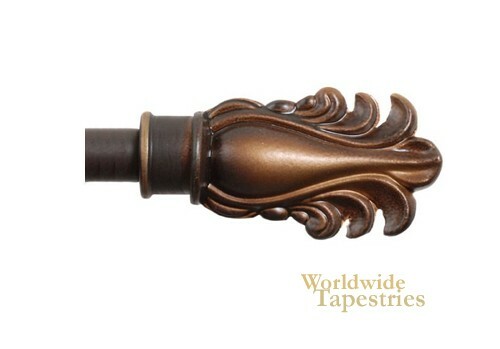 This tapestry rod "Feather Roman Bronze Close To Wall Tapestry Rod" gives an elegant method to hang your wall tapestry. This rod is flat and hangs very close to the wall. The tapestry rod extends from 15 to 28 inches in length, or 30-58 inches in length (adjustable), and all mounting hardware are included in this rod set, including 2 brackets. Please note that tapestry tassels are not suitable with "close to wall" type tapestry rods. NOTE: Rods must be purchased together with a tapestry (one rod per tapestry) and are not sold separately. Dimensions: W 15" - 28"
Dimensions: W 30" - 58"